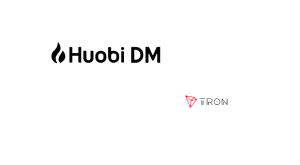 We determine the monthly value of this index by using proprietary, quantifiable indicators to analyze three market factors: volatility, market sentiment, and continued advancement of the sector. The index ranges from highly bearish to highly bullish. Volatility in leading crypto assets decreased throughout the month of January following the late-2018 run-up in volatility. In terms of market sentiment, we’re seeing a combination of less public attention on crypto “hype” — e.g., headlines, a 24-hour crypto news cycle, and ICOs — and sustained institutional interest in crypto exposure. 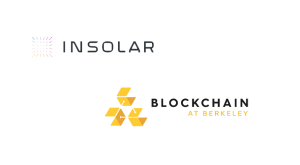 We’re also seeing a compelling combination of (1) teams and institutions working on blockchain use cases and (2) increased usage of blockchain networks themselves. BTC’s 30-day price correlations to ETH, BCH, and LTC closed the month as very positive (i.e. close to a value of 1), though BTC was less correlated to LTC than it was to ETH and BCH. Of the cryptoassets on SFOX, LTC and BCH were the least correlated, ending the month with a 30-day correlation value of 0.699 (still fairly positive). ETH and the S&P 500 were the most negatively correlated assets at -0.831, and the asset pair showing the least correlation (i.e. close to a value of 0) is BCH and gold at 0.079. 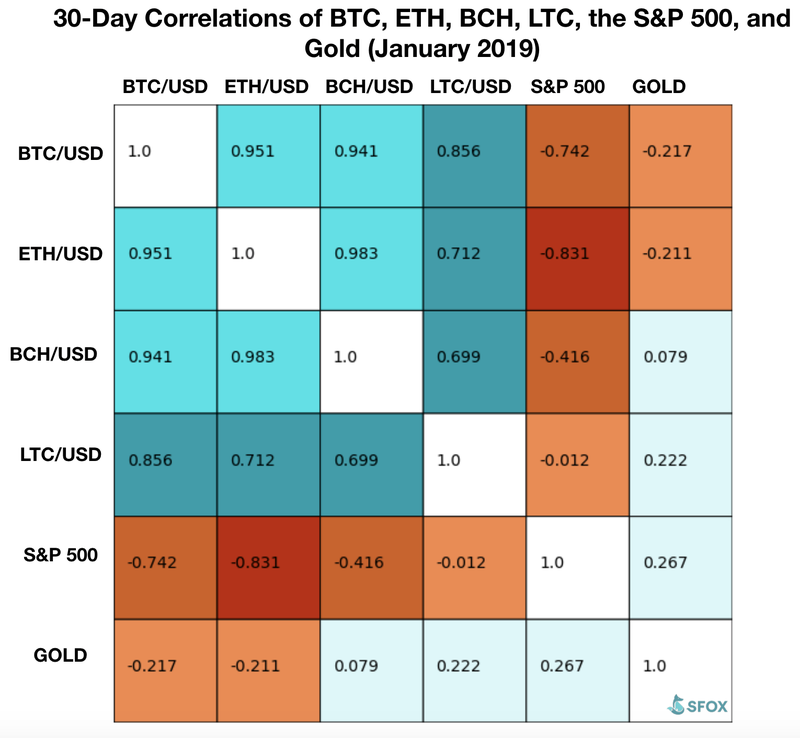 A graph of those 30-day correlations over the past month shows that there has been a significant amount of fluctuation in BTC’s correlations to the S&P 500 and gold over the last month. On the other hand, BTC’s correlations to ETH, BCH, and LTC were fairly stable throughout the month, with the exception of a dip in correlation values on the 17th. After an uptick in marketwide crypto volatility at the end of last year, January saw prices stabilize somewhat — BTC, for instance, ranged between $3,500 and $3,700 for over half the month. If we look at the 30-day historical volatilities of ETH, BCH, and LTC as a percentage of BTC’s 30-day historical volatility, we see that ETH and LTC’s movements were in line with BTC’s — that’s what the fairly horizontal slope of those lines tell us. BCH, in contrast, experienced a sharp drop in its BTC-volatility-relative volatility from the 18th to the 20th — from 300% to 200%, bringing it in line with the BTC-volatility-relative volatilities of ETH and LTC. BCH’s decrease in volatility may signal that the conflict between BCH and BSV is subsiding. As we discussed in our year-end 2018 volatility report, BCH’s volatility initially spiked in November in anticipation of the November hard fork that created BSV — and that volatility only continued during the hash war that followed the fork. More recently, however, the BCH and BSV camps appear to have carved out a reasonably peaceful coexistence, focusing more on continuing to develop their own projects rather than attacking each other. From lessened uncertainty and lessened speculation — on both sides of the aisle — comes decreased volatility. The overall decrease in crypto volatility may reflect the industry’s current “building phase.” With less hype and fewer major headlines in the past month, the focus has instead been on strong, dedicated teams building actually useful products and services. This redirection of attention to product development rather than avid market-watching could ultimately prove to not just correspond to lower volatility, but also make the crypto ecosystem generally healthier. Watch CBOE BTC futures expiration on February 13th, and CME Bitcoin futures last-trade date on February 22nd. Crypto volatility typically moves around the time of futures expirations. Watch the Ethereum Constantinople hard fork, expected on February 27th. The hard fork focuses on upgrades designed to ease Ethereum’s transition from proof of work to proof of stake. While it’s not expected that two separate blockchains will continue from this, as was the case with the Bitcoin Cash hard fork last November, forking networks breed some degree of uncertainty — which stokes volatility. Use the SFOX edge in volatile times through our proprietary algorithms directly from your SFOX account. 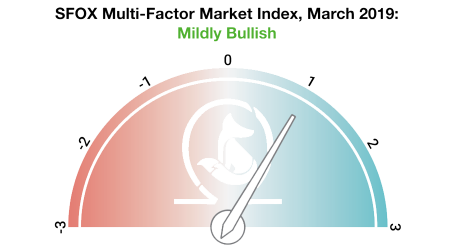 The SFOX Multi-Factor Market Index is calculated using a proprietary formula that combines quantified data on search traffic, blockchain transactions, and crypto volatility. Different liquidity providers experience widely varying trade volumes. For example, according to CoinMarketCap, Binance saw over $20 billion USD in trading volume over the last month, whereas Bitstamp saw $2 billion USD in trading volume — an order-of-magnitude difference. Therefore, treating any single liquidity provider’s data as representative of the overall market is myopic. Readers should note that we have also enabled the trading of Bitcoin SV and Ethereum Classic on SFOX. We are still in the process of collecting sufficient data on these cryptoassets to analyze them in accordance with our above standards. 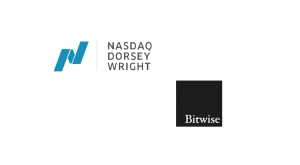 Presently, we anticipate that data on ETC will be in the volatility report starting next month (the February 2019 edition), and data on BSV will be added to the report in the following month (the March 2019 edition). 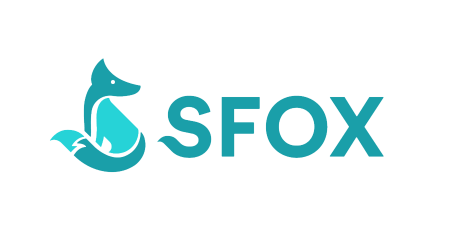 SFOX is a premier broker-dealer for sophisticated cryptocurrency investors. 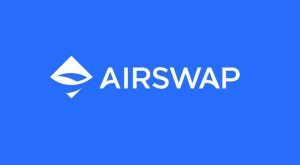 Their platform is specifically optimized to meet the rigorous standards of high-volume and institutional investors and give them a competitive edge when trading. 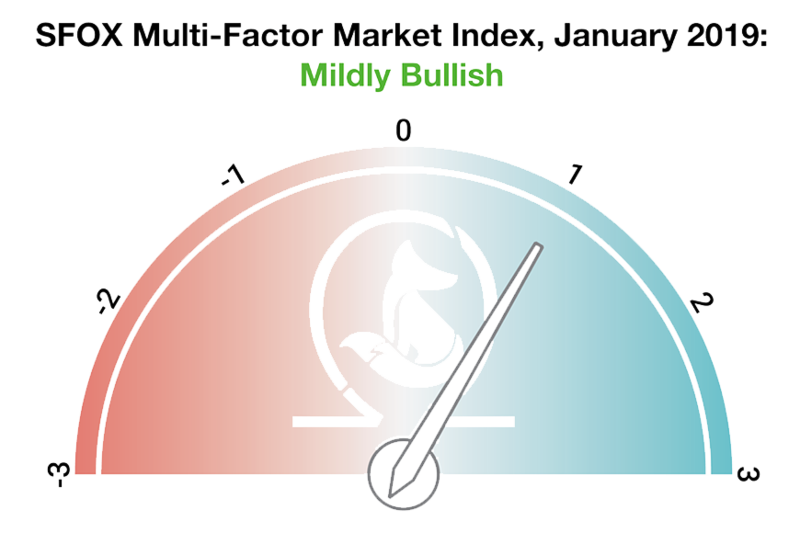 The SFOX Research team provides in-depth analysis of the crypto market, including a monthly volatility report which analyzes market data and sentiment.